German dramatist and theatrical manager; born in Hamburg March 8, 1838; son of Eduard Theodor l'Arronge (Aaron). He received a musical training at the conservatorium at Leipsic, and officiated later as conductor of the orchestra in theaters in Cologne, Königsberg, Würzburg, Stuttgart, and other cities. In 1866 he settled in Berlin to assume the direction of Kroll's Opera-House, for which he wrote his first farce, "Das Grosse Los," the success of which determined him to devote himself to play-writing. His next piece, "Gebrüder Bock," was represented at the Wallner Theater, Berlin. From 1869 to 1872 he edited the "Berliner Gerichtszeitung," and during that time wrote the "Spitzenkönig" (in collaboration with Hugo Müller), "Die Kläffer" (with Heinrich Wilken), and the "Registrator auf Reisen" (with Gustav von Moser). From his own pen unaided there appeared the minor piece "Papa Hat's Erlaubt," and the comedy "Die Weisse Katze," produced at the Berlin Viktoria Theater. His great success, however, was "Mein Leopold," which, when produced in 1873, at once placed him on a very high plane in German dramatic literature. It demonstrated his power to picture for stage production the popular life of modern Berlin. The play at once found its way to the stages of every large city in Germany, and was translated and adapted for the theaters of other countries in Europe as well as for the American stage. 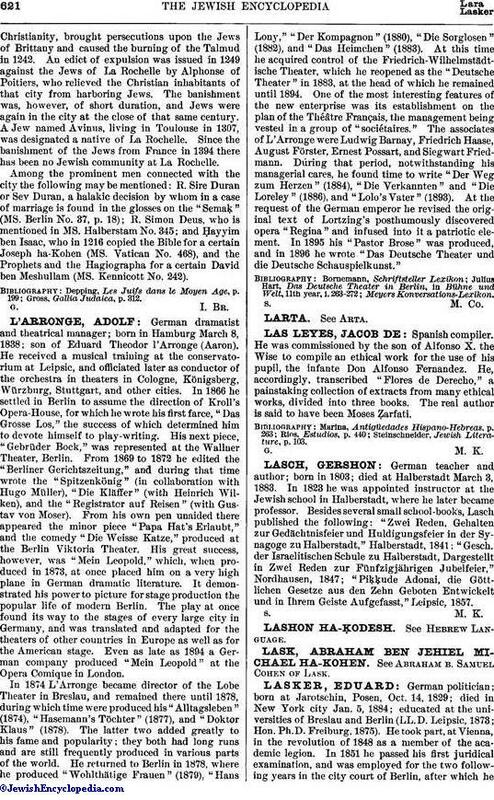 Even as late as 1894 a German company produced "Mein Leopold" at the Opera Comique in London. In 1874 L'Arronge became director of the Lobe Theater in Breslau, and remained there until 1878, during which time were produced his "Alltagsleben" (1874), "Hasemann's Töchter" (1877), and "Doktor Klaus" (1878). The latter two added greatly to his fame and popularity; they both had long runs and are still frequently produced in various parts of the world. He returned to Berlin in 1878, where he produced "Wohlthätige Frauen" (1879), "Hans Lony," "Der Kompagnon" (1880), "Die Sorglosen" (1882), and "Das Heimchen" (1883). At this time he acquired control of the Friedrich-Wilhelmstädtische Theater, which he reopened as the "Deutsche Theater" in 1883, at the head of which he remained until 1894. One of the most interesting features of the new enterprise was its establishment on the plan of the Théâtre Français, the management being vested in a group of "sociétaires." The associates of L'Arronge were Ludwig Barnay, Friedrich Haase, August Förster, Ernest Possart, and Siegwart Friedmann. During that period, notwithstanding his managerial cares, he found time to write "Der Weg zum Herzen" (1884), "Die Verkannten" and "Die Loreley" (1886), and "Lolo's Vater" (1893). At the request of the German emperor he revised the original text of Lortzing's posthumously discovered opera "Regina" and infused into it a patriotic element. In 1895 his "Pastor Brose" was produced, and in 1896 he wrote "Das Deutsche Theater und die Deutsche Schauspielkunst."